Here at LauraLaw, we have noticed lately in national and local news a disturbing trend of mothers abandoning their infant children, whether on the side of the road, in a dumpster, or even on the doorstep of a hospital. This is particularly noteworthy because it appears that some of these mothers are actually trying to take the appropriate steps to follow the Infant Safe Haven Laws. However, it is rare in the stories that we have come across that the mothers have done what the law requires of them. One story in particular struck a chord here at LauraLaw. On Tuesday, November 3, 2015 at around 3:00 a.m., Teresa Alvarez, a cleaning crew member at Presence Saint Mary’s Medical Center, spotted a jacket that appeared to be moving on the steps of the Nazareth Family Center portion of the Medical Center. Alvarez unfolded the tightly bundled jacket to find that there was a newborn baby girl with her umbilical cord still attached. The child was immediately taken to Lurie Children’s Hospital and was reported to be in good condition following the event. This story piqued our interest in large part because a mother has the right to relinquish custody of her child if she cannot care for that child, as long as the appropriate steps are taken to ensure the safety of the child. 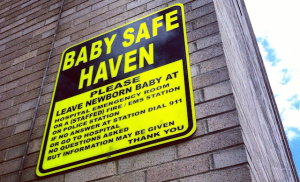 In this story, it appears that the mother was trying to ensure the safety of her child by leaving her at the Medical Center (and not on the side of the road), but she did not follow the steps mandated by the Infant Safe Haven Laws. The Infant Safe Haven Laws require that the child being relinquished is 30 days old or younger at the time the child is initially relinquished, and that the child is not a product of abuse or neglect. In addition, the mother must relinquish the child to a hospital, a police station, a county sheriff’s office, a campus police department located on any college campus or university, a fire station, an emergency medical facility, or any of the district headquarters of the Illinois State Police. Also, the mother must relinquish the child to the care of a staff member, she cannot simply leave the child on the steps of one of these facilities. That is why the mother in our news case did not follow the proper protocols; she just left her child on the steps of the Medical Center rather than giving her child to a staff member of the Medical Center. Situations like this happen all too often, as we are seeing on the news, but they can be avoided if these mothers understand their rights. If you or anyone you know needs help navigating the Infant Safe Haven Laws, please contact us here at LauraLaw and one of our experienced attorneys will be happy to talk you through your options and help you take the proper legal steps to ensure the safety of your child.